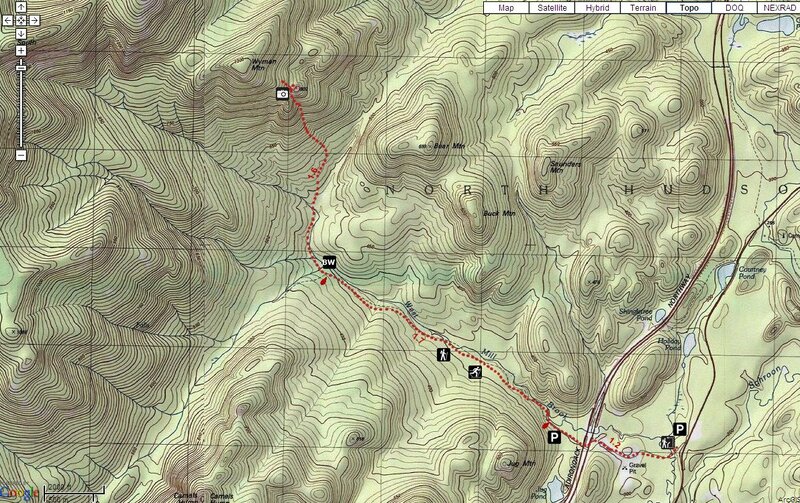 Our chosen hike for Monday was the 3304' Wyman Mountain (just southeast of East Dix). 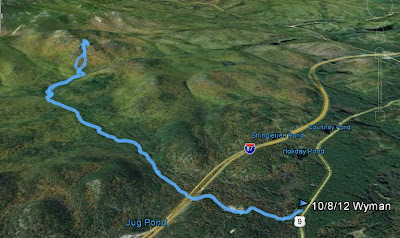 The way we chose to access Wyman was to bushwhack from the end of the West Mill Brook Trail. You can even drive through the culvert under I-87 to get to the trailhead. 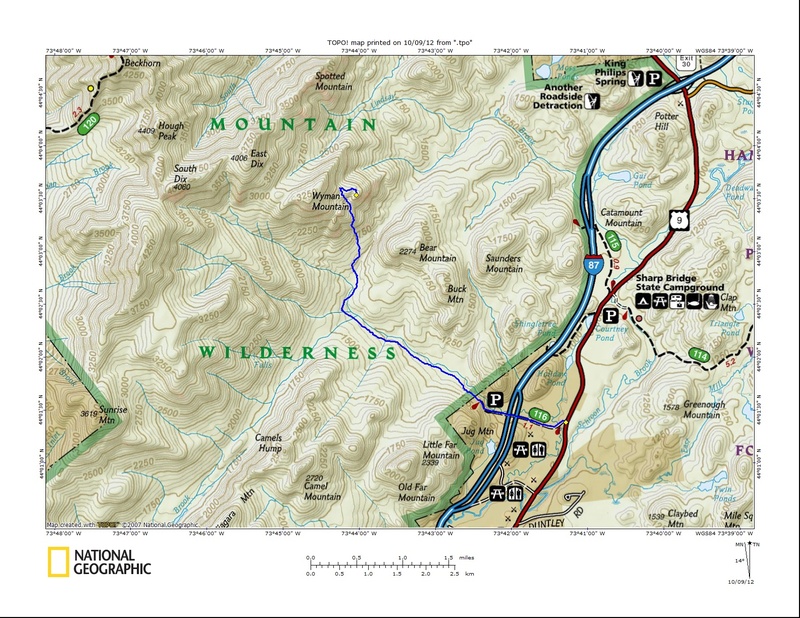 Once at the trailhead, there is a barrier preventing vehicle access to the wilderness area. The West Mill Brook Trail begins at this point. It is still shown on DEC maps, but is not marked. There is no trail register either. In any case, the trail is really an old jeep road, and is in fine shape. It is also relatively flat, climbing only 350' in 2 miles. Near the end of the trail, the trail hooks left and begins a small climb. At that point we hooked right and departed the trail to drop down to Mill Brook. There is a confluence there of a drainage with Mill Brook and we found some great waterfalls. 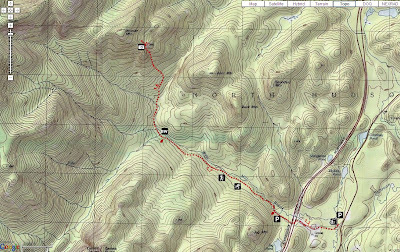 We continued in a northerly direction into the draw between Wyman Mountain to the west and Bear Mountain to the east. After passing a beaver pond, we began to angle up Wyman. The southern approach to Wyman looked pretty steep on the map, so we wanted to approach from the east. A northerly approach looked even easier, but would have added another mile or two onto our hike. We knew that the east approach contained two sizeable bumps with a draw between them. The "bumps" were quite sizable walls of rock. The draw contained lots of car sized boulders. We hit the left wall and skirted right trying to stay between the wall and the boulders. It mostly worked. Leesa was getting tired from the steep climb, but she was game to continue. At the top of the draw, we were between to fantastic mound of rock at 2600' . We continued a little further to 2750', but it was 1:30 PM. I was worried that at the pace Leesa was going, it would take another hour to reach the summit, and we probably wouldn't be out before dark. She wouldn't like that. I said, "Let's turn around here and see if we can get on top of the false summit mound of rock for a view, and then we'll go down to be out before dark". She agreed. It looked like the more northern of the rock formations was larger and would definitely offer fantastic views. I found a rock seam in the western flank of the rock, and up we went. Wow, what a spot! We got the top of the false summit and were floored. It was just fantastic. We stayed there for an hour and couldn't get over it. Great views of the Dixes, Giant, Rocky Peak Ridge, the Vermont skyline and all the other nearby small rocky summit peaks (Bear, Buck, Saunders, Spotted). Eventually we had to leave. It was 2:30, and I told Leesa I'd have her out before dark. Neither one of us wanted to leave. We retraced our route and made it back to the car by 5:45 PM. It was just a spectacular day. We are both ready to return to this area for further exploration. Great stuff. Really enjoyable to read about other areas like this. Thanks. I'm glad you enjoyed it! Enjoyed both TRs. I haven't done any of the bushwhacks accessed from the east, but a bunch of years ago I did the route from East Dix out over Spotted and E-Town No. 4 peaks. Same general area as your hikes last weekend, with very similar terrain: rocky, open, great views. Makes a nice loop by going up the E Dix slide and out over the other peaks. Access is from the Bouquet on Rt 73. Highly recommended. I'll be back for sure. Lots to see in this area. Spotted Mountain is on my list. Right now I'm in Washington State for 2 weeks. Today I climbed Granite Mountain in the Mount Baker Snoqualmie National Forest. Great hike. 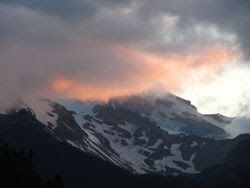 Off to the Alpine Lakes Wilderness tomorrow. Whoa, jealous! Backpack into the Echantment Lakes if you get the chance while you're out there. That's where we're headed today but we may wait until tommorrow to backpack in. Today's rain may be a little too much.